H2Joe had a lot of love to share on Valentine’s Day. The long-stemmed carnations he carried served as a perfect nod to his long-standing relationship with the Central Utah Water Conservancy District’s Central Utah Gardens. 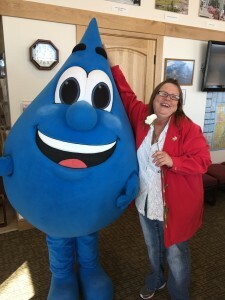 But who could have guessed the love people throughout Duchesne County would show for the fuzzy little water drop? Our snapshot gallery only touches on the many friendships he made this February. At the Duchesne County Senior Center, H2Joe brought the bingo game to a standstill. The ladies in the room surrounded him so closely photographers couldn’t get close enough to capture the moment. Of course, H2Joe was on a mission to spread the word about CUWCD’s new Facebook page and all the insights it offers on the district’s ongoing mission. But his new friends in Duchesne County left their mark, too. They wanted to make sure it wouldn’t be the last time he makes surprise visits around the district, putting an adorable face on the service that ensures fresh, usable water for farms, industries and municipalities. What would your day be like without water?